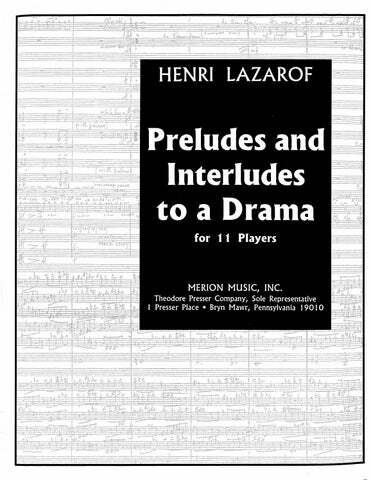 Taking his cue from the great masters of the past, Henri Lazarof is a composer committed to the constant development of his art. 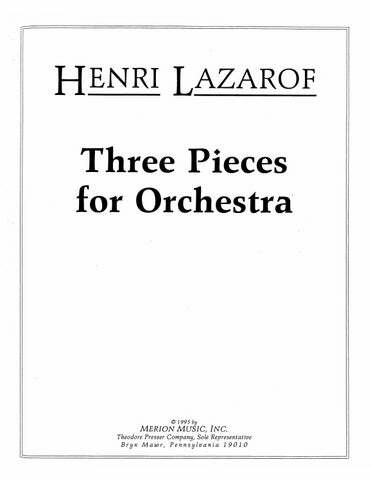 In his search for new ideas and forms Lazarof has produced a unique and varied catalog of scores that has been acclaimed in major musical centers from Tokyo to San Francisco, and from Oslo to Cape Town. An American citizen who makes his home in Los Angeles, Lazarof is, however, a man of the world whose art transcends both geographical and idiomatic boundaries. He is a demanding self-critic, constantly searching for the ultimate in expression while experimenting with the latest style trends. 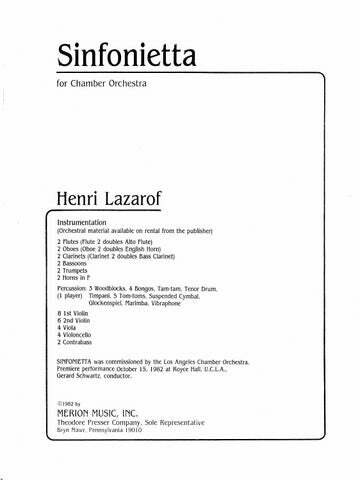 Lazarof has not suffered from neglect by the professionals: leading orchestras such as the Berlin Philharmonic, ballet companies like the San Francisco Ballet, and distinguished chamber music groups, plus famous soloists have featured his music. Lazarof has successfully proven that there is both an audience and a market for well-constructed, meaningful contemporary music. Born in Sofia, Bulgaria on April 12, 1932, Lazarof began his musical training at the age of six. Coming to the United States in 1957, Lazarof studied at Brandeis University on a full scholarship with Arthur Berger and Harold Shapiro and in 1959 received the degree of Master of Fine Arts. It was during his stay at Brandeis that Lazarof began to receive attention for his pronounced creative gifts. In 1958 his String Quartet was awarded First Prize from Boston’s Brookline Public Library, while his Cantata received a commission from Brandeis University for its 1959 Arts Festival. 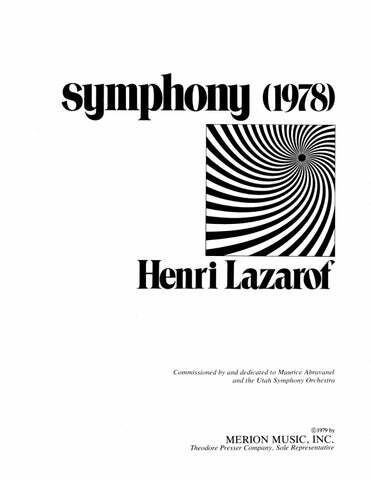 Lazarof’s international reputation grew in 1966 when he was awarded the first International Prize of Milan for Structures Sonores. A tireless worker, Lazarof completed seven major works during 1970-71, when the West German government named him Artist-in-Residence in West Berlin. Then, in 1971, he was named the first recipient of the University of California’s Institute for Creative Arts Award. 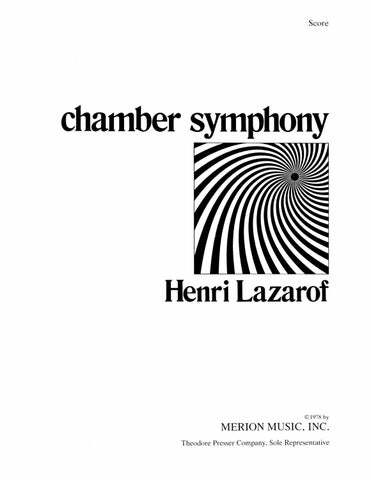 Returning from his Berlin residency, Lazarof was named Artistic Director of the 1973 Contemporary Music Festival at U.C.L.A., and Los Angeles enjoyed two active seasons of new music. 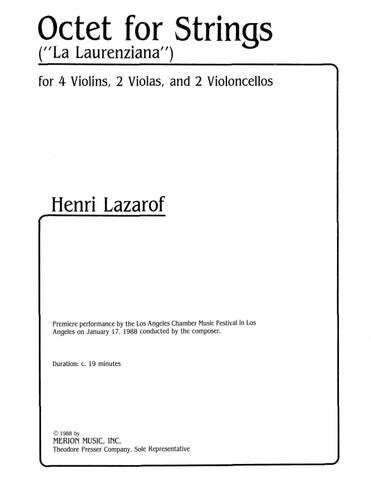 Lazarof further contributed to the musical life of Los Angeles by commissioning four works which were premiered during the 1974-75 Festival. 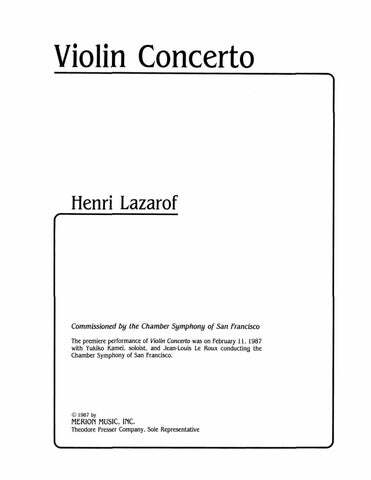 Also in 1974, Arthur Weisberg presented Lazarof’s Third Chamber Concerto in Carnegie Recital Hall as well as the first of what were to be dozens of performances of his Duo-1973. 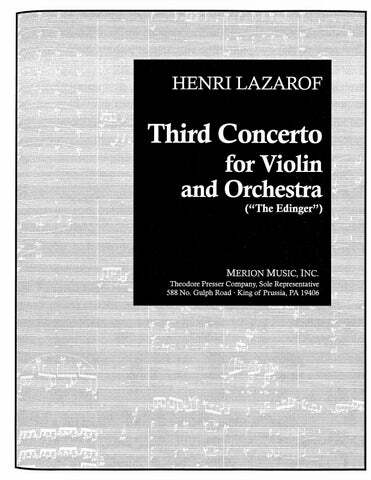 The Concerto for Orchestra, written in 1977, won second place in the Kennedy Center Friedheim Awards. 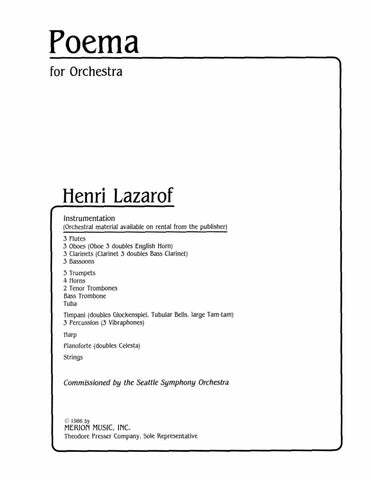 Lazarof’s works have since been nominated for many other awards, including the University of Louisville Grawemeyer Award and the Grammy. One of the busiest and most prolific composers of his generation, Henri Lazarof’s 65th birthday year was marked by more than a dozen tribute performances of his music, including several premieres and new recordings. 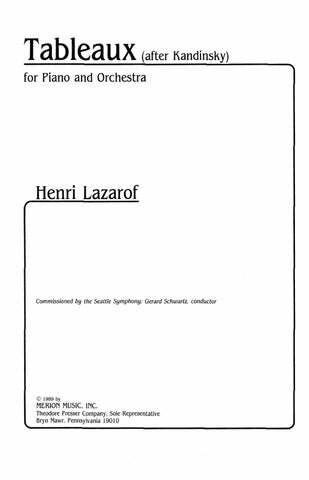 In 1998, his In Celebration for Chorus and Orchestra was the centerpiece work for the Grand Opening of the Seattle Symphony’s new concert hall. By refusing to settle within any one ideology of style – even those of his own previous works – Lazarof has remained faithful to the principle of growth and exploration, producing a body of works that will endure. for Brass and Percussion 16:00 4Tpt. 4Hn. 4Tbn. 2Tuba 2Perc. for 16 Strings and 2 Horns 14:10 2Hn. 9Vln. 3Vla. 3Vcl. Cb. 20:00 Fl. Ob. Cl. Perc. Pno. Vln. Vcl. Cb. 23:00 Cl. Hn. Pno. Vln. Vla. Vcl. 16:00 Cl. B.Cl. Hn. 2Perc. Pno.(Cel.) Hp. Vln. Vcl. La Laurenziana 19:00 4Vln. 2Vla. 2Vcl. for 10 Players 15:35 Fl./A.Fl. Ob. Cl. B.Cl. Hn. 2Perc. Pno./Cel./Harm. Hp. 2Vcl. 20:00 1 1 2(B.Cl.) 1 – 1 1 0 0; Perc. Vln. Vla. Vcl. for 12 Soloists 15:30 Fl. Ob. Cl. Tpt. Hn. Tbn. Pno. Hp. Perc. Vln. Vla. Vcl. 18:00 1 2 0 2 – 2 0 0 0; Str. 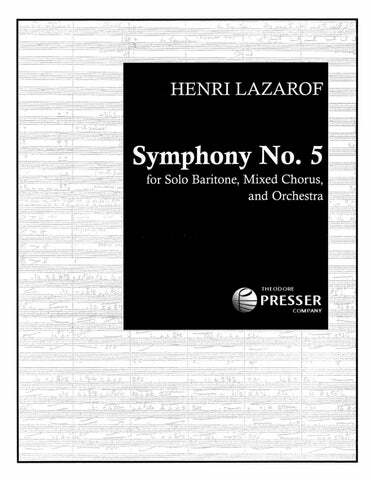 for Alto Solo, Bass Baritone Solo, SATB Chorus and Orchestra 52:20 4 4 4(B.Cl.) 4(Cbsn.) – 6 4 3(Bb.Tbn.) 1; Timp. (2Sets) 2Perc. 2Pno. 2Hp. Str. 21:00 4 4 4 4 – 6 4 4 1; Timp. 3Perc. Pno. Cel. 2Hp. Str. 22:00 4(Picc.) 4(E.H.) 4(B.Cl.) 4(Cbsn.) – 6 4 3(B.Tbn.) 1; 2Timp. 2Perc. Pno.(Cel.) Hp. Str. 25:00 SATB Chorus; 3(Picc.) 3 3(EbCl./ B.Cl.) 3(Cbsn.) – 4 3 3 1; Timp. 3Perc. Pno. Hp. Str. 27′ 2 2 2 2 – 2 2 0 0; Timp. Str. 14:00 3 3(E.H.) 3(B.Cl.) 3 – 4 3 3(B.Tbn.) 1; Timp./Perc. 3Vibr. Str. 16:30 3(Picc.) 3(E.H.) 3(B.Cl.) 3(Cbsn.) – 4 3 3 1; Timp. 3Perc. Pno.(Cel.) Hp. Str. 17:50 2 2 2 2 – 2 2 0 0; Perc. Str. 23:00 3 3 3 3 – 5 3 3 1; Timp. 3Perc. Pno. Hp. Str. (Winds of Sorrow) 22:00 3(Picc. AltoFl.) 3 3(B.Cl.) 3(Cbsn.) – 4 3 3(B.Tbn.) 1; Timp. 3Perc. Pno.(Cel.) Hp. Str. 16:00 3 3 3 3 – 4 3 3(B.Tbn. )1; Timp. 3Perc. Pno. Hp. Str. 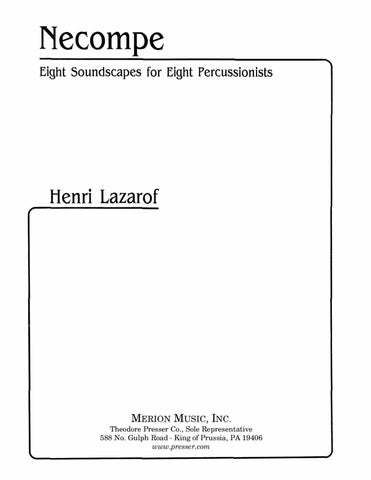 for Brass Quintet, Winds and Percussion 16:00 Solo 2Tpt. Hn. Tbn, B.Tbn. ; 2 2 2 2 – 2 2 2 0; 2Perc. 18:00 3 3(E.H.) 3(B.Cl.) 3(Cbsn.) – 4 3 3(B.Tbn.) 1; Timp. 3Perc. Pno.(Cel.) Hp. Str. 23′ Solo Vla. ; 3 3(E.H.) 2(2B.Cl.) 3(Cbsn.) – 4 3 3 1; Timp. Perc. Pno. Hp. Str. for Solo Violin and Strings 21:00 Solo Vln., Str. for Flute, Harp and Orchestra 20:00 Fl. Hp. Soli: 1 1 1 1 – 2 1 0 0; Timp.(dbl. Claves, Sus.Cym.) 2Perc. Cel. Str. 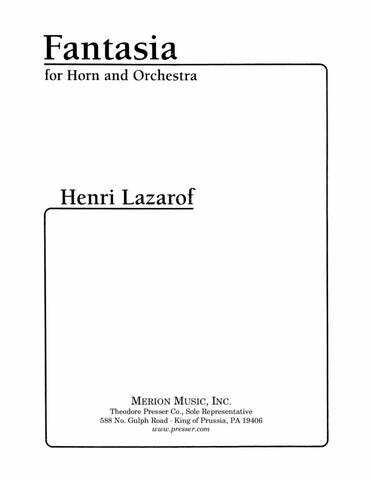 for French Horn and Orchestra 18:00 Solo Hn. ; 3 3 3 3 – 4 3 3(B.Tbn.) 1; Timp. 3Perc. Hp. Str. A Double Concerto for Violin, Violoncello and Orchestra 22:00 Vln. Vcl. soli; 3(dbl. A.Fl.) 3(dbl.E.H.) 3(dbl.B.Cl.) 3 – 4 3 3(B.Tbn.) 1; Timp. Pno.(Cel.) Hpsc. Harmonium. Hp. Str. 22:30 Solo Vcl. ; 3 3 3(B.Cl.) 3(Cbsn.) – 4 3(in C) 3(B.Tbn.) 1; Timp. 4Perc. Pno./Cel. Hp. Str. 22:00 Solo Fl.(dbl. Alto Fl. ); 2 2 2 2 – 2 2 1 0; Timp. 2Perc. Str. 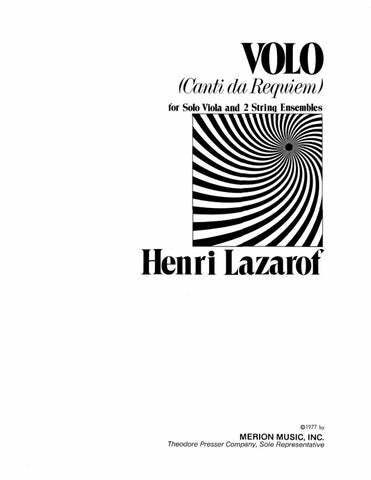 for Solo Baritone, Mixed Chorus and Orchestra 27:00 Solo Bar., SATB Chorus; 3(dbl. Alto Fl.) 3(dbl.E.H.) 3(dbl.B.Cl.) 3(dbl.Cbsn) – 4 3 3(B.Tbn.) 1; Timp. 3Perc. Pno. Hp. Str. for Piano and Orchestra 26:30 Solo Pno. ; 4(Picc./A.Fl.) 4(E.H.) 4(B.Cl.) 4(Cbsn.) – 6 4 3(B.Tbn.) 1; 4Timp. 4Perc.(2Vibr.) Pno. Cel.(Harm.) Hp. Str. 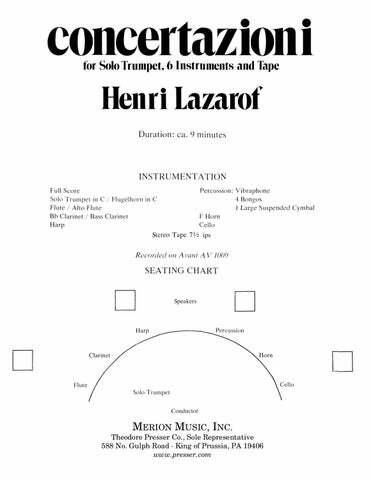 for Solo Trumpet, Brass and Percussion 15:15 Solo Tpt. ; 0 0 0 0 – 4 3 4(B.Tbn.) 2; 2Perc. 22:00 Solo Vln. ; 3(dbl. AltoFl.) 3 3(dbl.B.Cl.) 3(dbl.Cbsn.) – 4 2 2 0; 2Perc. Str. 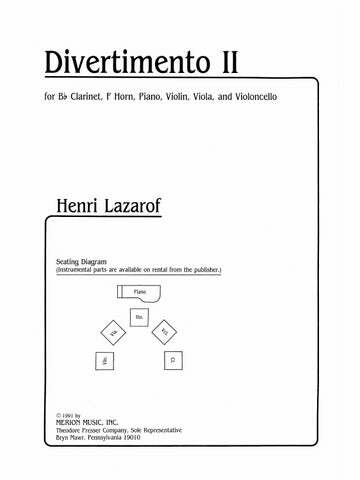 for Solo Viola and Orchestra Solo Vla. ; 3(A.Fl.) 3(E.H.) 3(B.Cl.) 3 – 4 3 3(B.Tbn.) 0; Timp. 3Perc. Pno.(Cel.) Hp. Str. 25:00 Solo Vln. ; 2 2(E.H.) 2(B.Cl.) 2 – 2 2 0 0; 2Perc. Pno.(Cel.) Hp. Str. His music is rich in color and imaginative in expression. There is an immense intensity to be found in his music. …his music speaks with an urgency that transcends labels. This is solid, expressive music that proceeds out of the main tradition…carving its own form, making an original and personal statement. Mr. Lazarof uses his favored instruments with assurance and imagination. …This very modern depiction of flight is highly charged and masterfully conceived, full of imaginative orchestral detail. The alternation of echoes and textural contrasts between harp and vibraphone-marimba makes for surprisingly luscious, even pretty, effects. The most striking work was Momenti, an emotionally kaleidoscopic work for solo cello that is at once powerful and intimate. 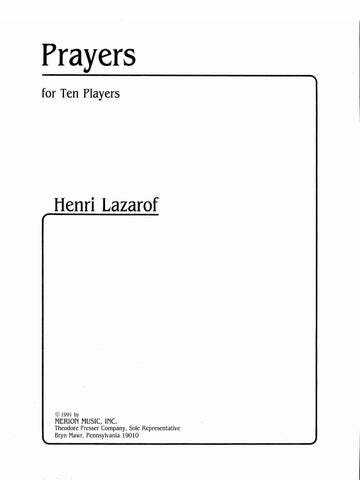 La Larenziana-[Octet for Strings] proved as stunning, imposing and poignant a sound experience as had been reported at its premiere performance. The work is vibrant proof of the continuing viability of the piano-trio genre…the four-movement trio explores deeply the many possibilities of color, juxtaposition, sonority and texture, all within a tight dramatic frameork.